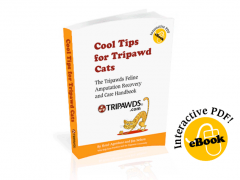 We just discovered one of our favorite veterinarian advice books, is now available for download from eBooks.com! Vet Confidential – An Insider’s Guide to Protecting Your Pet’s Health, by Dr. Louise Murray is an honest and vital resource for pet owners who want to make sure their cherished pets will live a long, happy, and healthy life. 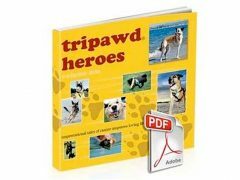 Read the Tripawds book review of Vet Confidential for complete details, or to purchase a good ol’ fashioned hard copy. But if you have an eBook reader, consider downloading this easy to read veterinary guidebook that cuts through the confusion and addresses the common concerns of most pet owners. From an experienced and highly respected authority in the veterinary world comes a comprehensive must-have guide to everything you need to know to ensure high-quality health care for your beloved animal companions. Our pets mean the world to us and we go out of our way to pamper them, from gourmet cat treats to doggie daycare. Dr. Murray also gives counsel on where to turn if you suspect improper care, and provides comforting advice on saying good-bye when the time comes. There are various times when you need to select a veterinarian. Maybe you’ve just brought home a new pet (or two). Or perhaps you’ve recently moved and are searching for a good practice nearby. If your pet has developed health problems, you may suddenly ﬁnd it more important than ever that she has the best care available. You may even have concerns about your current veterinary practice and be considering a change. When you ﬁnd yourself looking for a veterinarian–for whatever reason–what’s the best way to go about choosing the right one for your pet? If you’re like most people, you have some personal preferences that may inﬂuence your choice. Maybe there’s a practice that’s in a particularly convenient location or has hours best suited to your schedule. Perhaps you feel your dog is more comfortable with a female doctor, or your cat is happier in practices that handle only felines. There may be a local veterinary hospital that your family has trusted for years, or that a friend recommends. These considerations are indeed important, but you should also weigh some objective criteria when deciding which doctor to entrust with your pet’s well-being. If you have a choice of practices in your area, you want to use the one that offers your pet the highest standard of care and avoid those that aren’t achieving the quality of medicine you’re seeking. To help you in your search, I’ve compiled a list of questions that will enable you to evaluate various aspects of each veterinary practice you consider. The areas covered include patient care, equipment, stafﬁng, philosophy, and how up-to-date the facility is. Using this checklist, you will gain the ability to more knowledgeably oversee your pet’s health care. The checklist is divided into two sections. The ﬁrst contains questions about the veterinary practice you’re considering that can be answered over the phone by a staff member. The second section contains topics that are best evaluated during an appointment. There are two worksheets at the end of the chapter where you can record the information you gather. One option when you’re evaluating a new practice is to schedule an appointment to take place without your pet. This will allow you and the veterinarian to focus on your concerns and have enough time for an informative discussion. Also, since your pet won’t have been seen at the practice, you may feel less awkward if you decide not to return. Be prepared to pay the normal fee for the appointment, even though your pet is not present. Don’t feel hesitant about letting the veterinarian know that you are trying to pick the right practice for your pet; many parents interview several pediatricians before selecting a doctor for their children, and you, too, have every right to do some investigating. If this suggestion is not convenient or affordable for you, you can evaluate the practice during your pet’s ﬁrst visit. You probably shouldn’t expect to be able to stop by a practice your pet has never been to and speak to the veterinarian without an appointment. Save on e-book downloads with these current promotions and coupon codes from eBooks.com!